The Penrod Arts Fair is known as “Indiana’s Nicest Day.” From its beginning, the Fair, originally dubbed the “Arts Fair at Oldfields,” has been the The Penrod Society’s signature event and most significant fundraiser. The first Fair was a one-day, afternoon event (2p.m. to 7 p.m.) that took place at Oldfields on Saturday, September 9, 1967—the first Saturday after Labor Day. Public admission was $2 (rich in 1967! ), and attendees were treated to—or, rather, enticed to attend with—free beer. The event included live music, food and drink, paintings, and other art for sale. In some ways, little has changed in 52 years. Today, the Penrod Arts Fair is still a one-day event taking place on the Newfields campus every year on the first Saturday after Labor Day, although now the Fair takes place from 9a.m. to 5p.m. In other ways, the Fair has changed dramatically. The Fair is now one of the largest single-day arts fairs in the country. The physical footprint of the Fair has grown significantly and now encompasses not only the land of Oldfields (now commonly referred to as the Lilly House), but also most of the other open outdoor spaces to the north and east of the IMA’s main building on the Newfields campus. The Penrod Arts Fair is held on the Newfields campus. The map below includes gate entrances (red) and parking locations (blue). 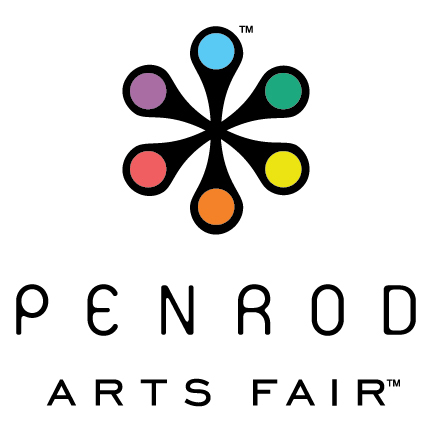 Each year the Penrod Arts Fair features approximately 350 artist booths divided among four main artist areas, which we designate as Artists Blue, Green, Yellow, and Red. In addition, the Fair includes around 75 non-artist booths for community organizations, which we refer to as “Projects” booths. Projects booths are also divided among four main areas, which we designate as Projects A, B, C, and D. Similarly, each year we have dozens of food and beverage vendors divided among three main food areas, Food Blue, Red, and Yellow. For the last several years, we have included a beer garden featuring beers from Indiana craft breweries. The Fair also includes a popular Children’s Area and multiple performance stages for live dance, blues, rock, folk, symphony, jazz, and other music and entertainment acts.